Press the Settings icon at the top right of the screen to open the menu. This is where you set up posBoss to talk to the printers you have plugged in to your router, or paired via bluetooth. The general printing settings appear on the right. These determine when you print order dockets and receipts. This setting determines whether the cash draw pops when you select Card as the payment type. Press Add Printer or select an already existing printer from the left. The printer’s settings window will open (as below). If you have multiple printers, make sure you set up the printer with your cash drawer attached first. Press the button to activate the printer for setup and use. The Network IP address or MAC address of the printer. These are the printers that are found on the network your iPad is connected to. Press the Search for Printers button and then select your printer. Tap to set up which menu sections print to which printer for orders (eg: food to kitchen printer, drinks to counter printer). Activate the printer to print receipts. (ie: don’t turn this on for a kitchen printer). 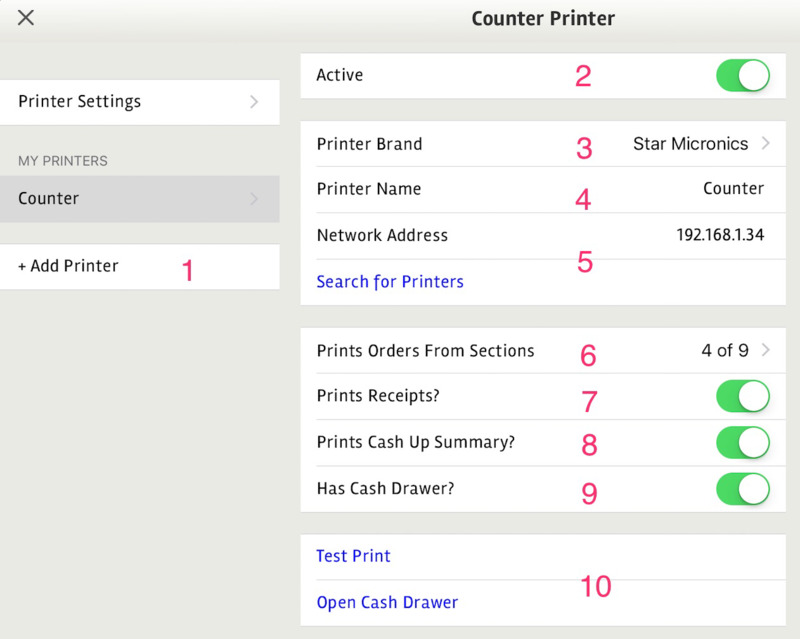 Print a cash up summary after you press submit on a cash up. Opens your till drawer (plugged into the printer) automatically on payment. Once your printer and cash drawer are set up, press these buttons to test your setup. *Please note with bluetooth printers you will need to successfully pair them with the iPad before they will appear in the search results.